An exclusive world-class grilling engine, three powerful burners, with iGrill 3 smart technology compatibility, all backed by the Weber 10 year lid-to-wheels warranty. This is the new standard in gas grilling. Weber CANNOT be converted to another gas type later. No conversion kits available. 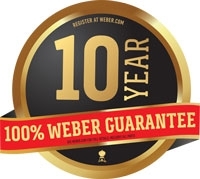 10 years All components from the date of purchase when assembled and operated in accordance with the accompanying Owner’s Manual, normal wear and tear excluded.